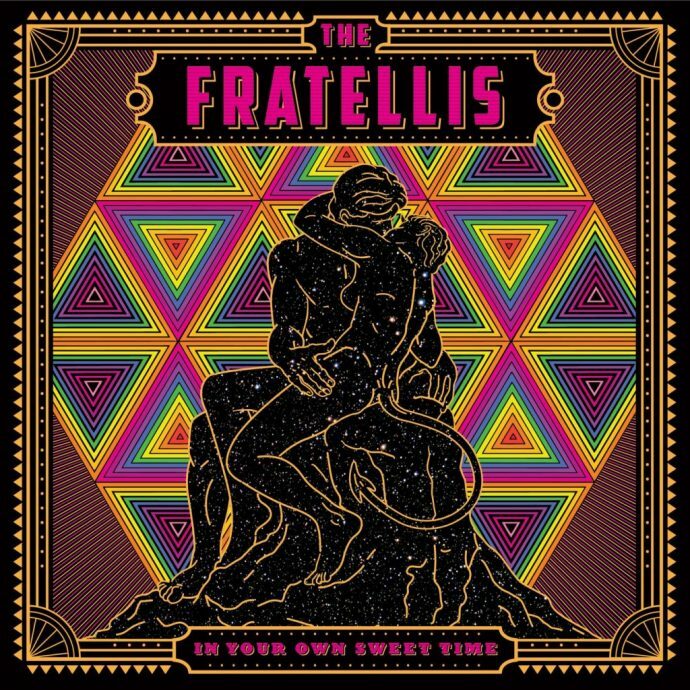 Much like a nearsighted person scanning the bar at the closing time, listeners may find that the choices on the latest release from The Fratellis, In Your Own Sweet Time, are good from far but far from good on closer inspection. While the Scottish band’s fifth full-length studio album is slick indie rock, the quality of the lyrics doesn’t go very deep and the overall sound gets old fairly quickly. What sounds like wordplay on first pass is at times nonsensical. The album starts with fun tracks that have so much vintage influence that you could roller-skate unironically to it, but eventually it gets repetitive and it all gets less fun – unless you are actually rollerskating to it, in which case, the party probably doesn’t stop. This is a fun, radio-friendly album. But, like most fun and radio-friendly albums, the lyrics don’t go too deep. The lines sound like they’re trying to go somewhere but don’t, often using clichés like “I’ve been pushing up daisies just to get a glimpse of something real.” So singer and songwriter Jon Fratelli died and got buried and is decomposing into flower fertilizer in an attempt to feel feelings? I don’t get it. It’s also got some contradictions to make you groan, like “I could be your slave if you would only beg from me.” There are all kinds of references being thrown around on “Starcrossed Losers:” Romeo and Juliet, Adam and Eve, a pot of gold… Our subjects refers to themselves as Romeo and Juliet despite their story not matching up with the star-crossed lovers. In this story, unstable Romeo just isn’t that into Juliet and he’s got to move on somewhere else, but she is crushing hard on him. Perhaps it’s supposed to be a story of poor timing, like Romeo and Juliet, but it sounds like this Romeo is just a rolling stone. But Romeo feels like they’re Adam and Eve. Juliet is convinced she is a pot of gold. “Sugartown” has some strangely infantile references to bouncing a ball and sucking on lollipops despite otherwise being about an ill-advised adult crush. “Indestructable” feels like a shoddy knock-off of Cake’s “Short Skirt, Long Jacket,” only at one point it breaks from describing this attractive, tough-as-painted-nails woman and switches to listing landmarks like Krakatoa and the Eiffel Tower, then it just turns into lists of unrelated things like “Prince of Darkness, chamomile.” “Advaita Shuffle” inexplicably borrows lyrics from “She’ll Be Coming Round the Mountain.” I wish that was a joke, but no, it really happens. The album starts strong with “Stand Up Tragedy:” Jon Fratelli’s falsetto and jangly guitar give it this slightly Prince-ish vibe (just don’t listen too closely to the lyrics.) The jangly guitar comes back on “Starcrossed Losers” and “Laughing Gas;” it’s so jangly on the latter that it’s got a taste of The Smiths’ “This Charming Man.” There’s an ‘80s touch to many of the songs: “I’ve Been Blind” could be an ‘80s one-hit wonder like The Outfield. “Sugartown” is a ‘50s love song. Jumping decades, “I Guess I Suppose” sounds like the watered-down, Kidz Bop version of a Jet song. To keep with the party sound of past albums, there are lots of non-words shouted out: “hoo-hoo” (“Stand Up Tragedy,”) “woo-hoo” (“Indestructable,”) “woo” and “huh-ha” (“I Guess I Suppose,”) “buh-bah” (“Sugartown,”) and other such repeated backing vocals that make sort-of singing along possible on the first listen. The album has slick production and the formula for catchy songs, but it gets repetitive. Because of the repetition, the later songs just get boring and not very memorable. “The Next Time We Wed,” at track 5, might be the last memorable song before the clump of songs with its bubbly keyboards and vocal swagger. The closing track, “I Am That,” finally breaks the mold with a Verve-like (with extra embellishments) introspective, but it’s a little late. In Your Own Sweet Time would make good background music. This is one of the very few albums that I liked more on the first listen than I have on subsequent replays. Things have been going downhill since that first listen and it’s not fun anymore. So put it on in the background, don’t listen too intently, and it will be just fine.